How much do you think the spread of extremist viewpoints on the internet is to blame for the mass shootings that have occurred in the US in recent years? The statistic shows a comparison of the results of a survey among Americans in 2011 and in 2013 on the reaons for mass shootings. They were asked how much they think the spread of extremist viewpoints on the Internet is responsible for these shootings. 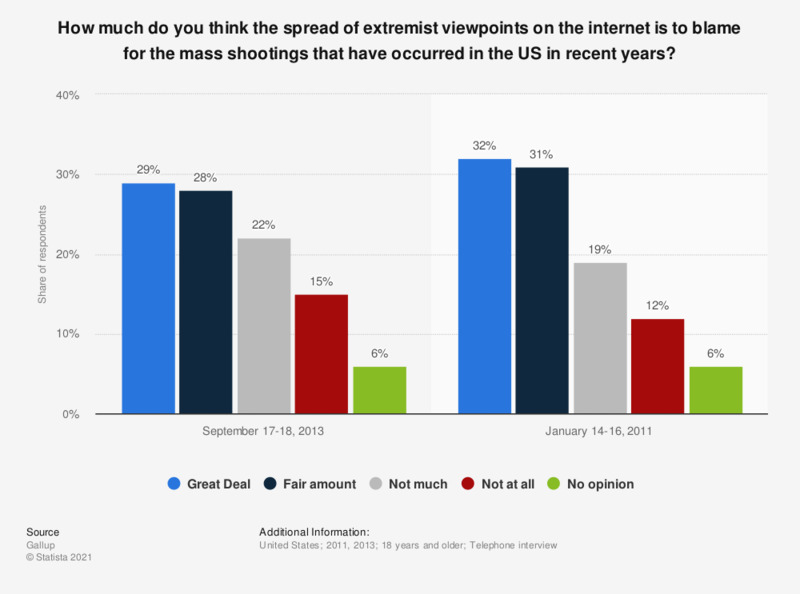 In January 2011, 32 percent of respondents said the spread of extremist viewpoints on the Internet was to blame a "great deal" for these shootings. In 2013, 29 percent of respondents said the same. The source does not provide the exact wording of the question. The wording here may therefore differ. The source does not provide the exact number of respondents. Do you support the use of genetically modified organisms (GMO's) in food production? Do you consider viewability a requirement when buying inventory for video? What is your overall opinion of the National Rifle Association (NRA)? How often does the National Rifle Association (NRA) reflect your views about guns?